The founder of the Lloyd Center for the Environment, Karen Gallup Lloyd, liked to discuss the deepest subjects over a cup of coffee with cream, a blend she insisted be the “color of the Potomac.” She was fascinated with the idea of balance and was drawn to a number of interests – Asian art, Native American mythology, psychology, music, and environmentalism – in her pursuit of it. When Mrs. Lloyd met Kathryn Duff in 1993, she must have known that her new friend, a talented architect, would someday bring to life their shared vision of a perfect balance between humans and nature. And, as of December 2016 – when bulldozers and backhoes broke into the earth at the Lloyd Center for the Environment – new ground in environmental stewardship was broken, thanks largely to the work of Ms. Duff, founder and lead architect at studio2sustain inc, New Bedford, MA. 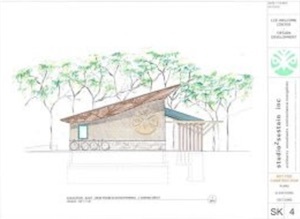 Architectural plans for a new Welcome Center at the Lloyd Center embrace the original vision of Mrs. Lloyd and adhere to the rigorous standards of the internationally renowned Living Building Challenge™ (LBC™). Currently, there are only 11 buildings in the world that are certified as conforming to the LBC™ standards. 2. The Water petal addresses the imperative of net positive water. “The bottom line,” Duff continues, “is that you can’t tie into a utility water supply system, and you have to generate your own water and disperse it on the site.” At the Lloyd Center, water comes from a well supply. In addition, rain that runs off the building will be collected in the ground within the footprint of the building, adding to the ground water and therefore, the well. There has been soils testing and sufficient engineering to insure that none of the water is thrown off-site. ‘Grey water’ (sink and water fountain run-off) from within the building itself will go into a ‘treatment garden’ on site and will be treated using plant material. Toilets will use a teaspoon of liquid foam instead of a tank of water, thereby creating a composting system to liquefy the waste. Later, this ‘black water’ will get pumped into a tank and taken off-site for treatment by the Town of Dartmouth. 3. The Energy petal requires net positive energy and is achieved by allowing no fossil fuel combustion in the building. Duff clarifies, “The Lloyd Center plans on doing this with a large solar array on top of the building, which will generate energy and store it in a Tesla Power Wall.” Because the building is designed to many of the standards of the International Passive House requirements, it will have triple pane windows (R9), as well as reclaimed insulation for the roof (R60), walls (R40), and floor (R30). This makes it so energy efficient that the water for hand washing and drinking will not freeze. 6. The Equity petal is based on providing the benefits of a building to all who use it. For example, if the building provides sunlight and ventilation, it has to provide it to all the people using the building, thereby creating a sense of equitability and accessibility. In addition, LBC™ certification requires that materials be purchased from organizations certified as JUST Organizations, meaning that they have not been found guilty of breaking child labor laws, illegal trafficking of materials, or violation of international procurement practices. 7. The Beauty petal requires that there are two pieces: the building has to be beautiful, and it has to be inspired. It has to inspire others to learn more about the environment and become part of a community. Duff recounts, “One of the earliest conversations we had with the Lloyd Center Staff and the Design Team involved kids in an education program who had an ‘aha moment’ when they arrived and became immersed in the forest floor where the building site is located. For more information, see also: Jason F. McLennan, International Living Future Institute (ILFI), the Cascadia Green Building Council, and The Living Building Challenge.